This excerpt from his personal journal (which he kept between 1800 and 1819, and published in the U.S. in 1820) is dated October 10, 1805, from the Saskatchewan: 1805-1807, p98. Harmon describes a significant feature of fur trade life: the taking of a country wife. "October 10, Thursday...an effectionate [sic] partner." "October 10, Thursday. This day a Canadians Daughter (a girl of about fourteen years of age) was offered me, and after mature consideration concerning the step I ought to take I finally concluded it would be best to accept of her, as it is customary for all the Gentlemen who come in this Country to remain any length of time to have a fair Partner, with whom they can pass away their time at least more sociably if not more agreeably than to live a lonely, solitary life as they must do if single. In case we can live in harmony together, my intentions are now to keep her as long as I remain in this uncivilized part of the world, but when I return to my native land shall endeavour to place her into the hands of some good honest Man, with whom she can pass the remainder of her Days in this Country much more agreeably, than it would be possible for her to do, were she to be taken down into the civilized world, where she would be a stranger to the People, their manners, customs & Language. Her Mother is of the Tribe of the Snare Indians, whose Country lies about the Rocky Mountain. The Girl is said to be of a mild disposition & even tempered, which are qualities very necessary to make an agreeable Woman and an effectionate Partner." Harmon had refused similar offers from Cree chiefs before, but in this case he may have found the girl's beauty too much to resist; or, perhaps he considered a Metis wife more acceptable than a First Nations wife. His anticipated future plan of passing his wife on to "some good honest Man" when he left the fur trade was known as "turning off." 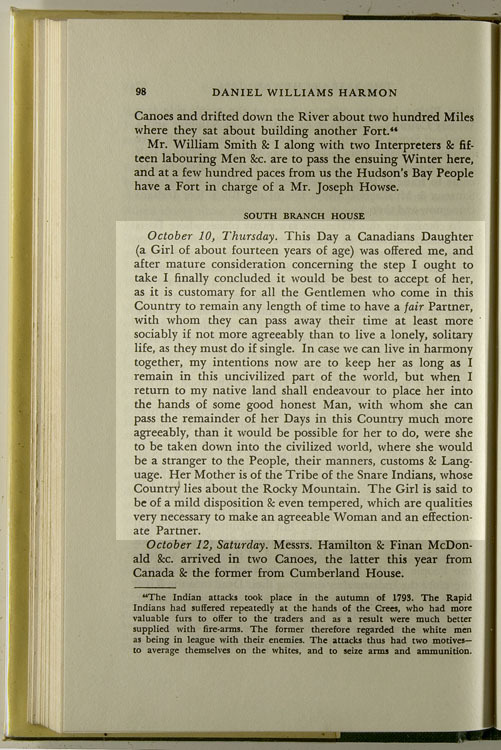 The North West Company placed few real restrictions on its employees' relationships with Native and Metis women; the Hudson's Bay Company, on the other hand, although it neither specifically prohibited nor specifically sanctioned country marriages, did discourage them for a variety of reasons and frequently objected to paying for the support of women and children.